Lithuania's former foreign minister Vygaudas Ušackas says he is missing a vision for the country's future, adding that an alternative will be needed to incumbent President Dalia Grybauskaitė in the upcoming presidential election. He has not, however, decided yet if he is running for president himself. "Alternatives are needed, otherwise we will live in a closed society. I currently miss a clear vision for Lithuania, which would outline Lithuania's future well-being," Ušackas told Lietuvos Ryto TV on Thursday. "In my opinion, the discussions surrounding the presidential election are rather active, with two years left until the election (...). My decision would be determined by, first of all, the situation in Lithuania and the world at the specific point in time in the run-up to the election, it will depend on my point of view, support from my family, and presence of a clear vision, which I personally have," said the diplomat, currently serving as the European Union's (EU) ambassador to Afghanistan. Speaking at a special news conference a week ago, Vilnius Mayor Artūras Zuokas severely criticized Grybauskaitė and invited the society to search for an alternative candidate for the presidential polls. Shortly after, popular singer Andrius Mamontovas wrote on his Facebook wall that Ušackas would be a good candidate for the post. "The need for an alternative is important, but my decision will not be determined by assessments or calls by Zuokas or other politicians but by encouragement from the people, such as Mamontovas, etc.," Ušackas said. The ambassador said he was feeling a "syndrome of fear" in Lithuania. "When I communicate to Lithuanian politicians and businesspeople, I feel a big syndrome of mistrust and fear. In my opinion, Lithuania needs leadership that will spread feelings and values of freedom, self-pride, openness, respect for others," he added. Ušackas, member of the ruling Homeland Union – Lithuanian Christian Democrats, also said that “evaluation of the party at the specific moment will be crucial” in the light of upcoming presidential election. Lithuania will pick a new president in June 2014, with general elections timed for mid-October this year. Commenting on the frail relations with Poland, Usackas said “both capitals – Warsaw and Vilnius – should assume the responsibility for the condition of the ties." "Obviously, there is lack of leadership, lack of personal contacts that were inititated by President Valdas Adamkus," the diplomat added. Ušackas also revealed he had not had the chance to see the president Grybauskaitė after he resigned from a ministerial position in the wake of her her declaring mistrust, although he had expressed willingness to meet with the leader during her visit in Afghanistan. "There was no interest on her side to see me, although I had expressed the interest. The reply was that it was not on her agenda," he said. 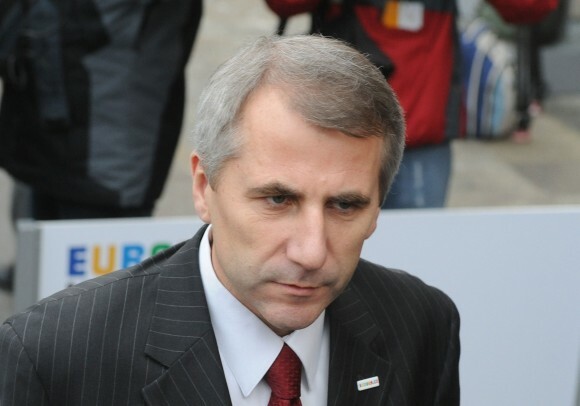 Ušackas was Lithuania's foreign minister between December 2008 and January 2010, when he resigned following a dispute with Grybauskaitė. Shortly after, Ušackas was appointed as EU ambassador to Afghanistan.